As a lover of color, I tend to like it to permeate everything I do and see at home. That said, I am slowly coming around to the idea that less is more, and subsequently plan on painting every room in our hypothetical new house the same shade of bright white. The accessories in said “bright white” home though? Those are going to reek of the rainbow, and so my new set of DIY Painted Clothespin Photo + Card Holders are going to fit right in. Read on to learn how to make them yourself. 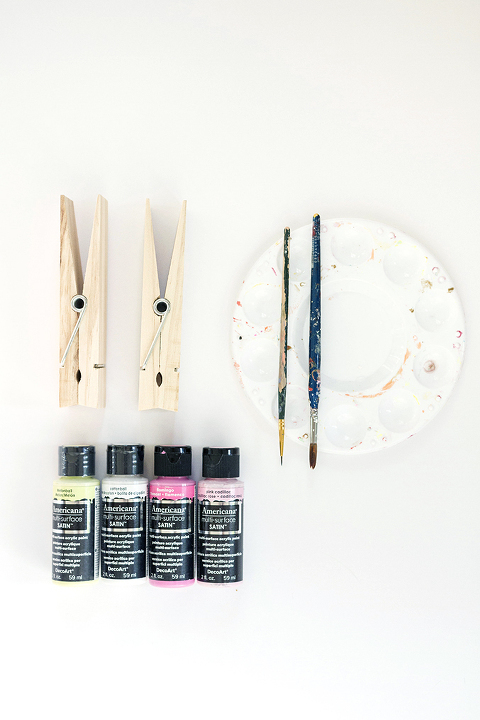 Start by painting both of the clothespins with 2-3 coats of the white “Cottonball” DecoArt paint until you can no longer see the wood grain beneath it. Allow the paint to dry for about 20 minutes in between each coat, and give the final coat a full hour to cure. Before you move on to painting the pattern, look at the flat surface of the clothespin and imagine that there are three columns, running top to bottom. The painted pattern for this particular project will zig-zag up from left to right in the first column, zig-zag down from left to right in the middle column and alternate upwards again in the last column. The colors also will alternate randomly based on your inclination. 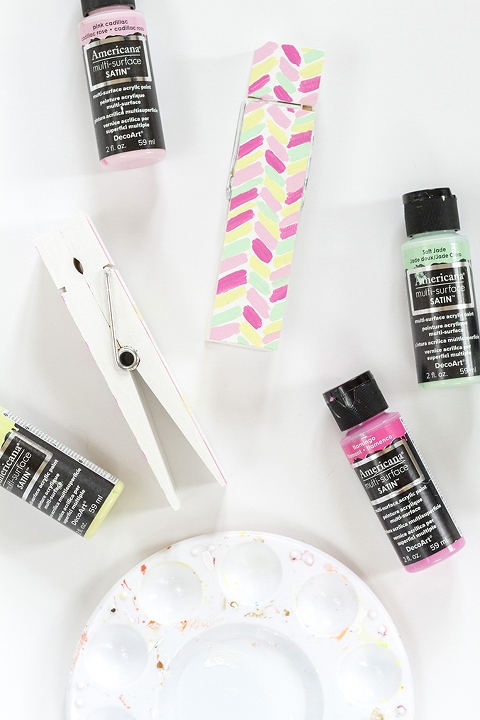 Now that you have the pattern planned out, squeeze separated quarter-sized dollops of paint onto a plastic painter’s tray, and dip the detail paintbrush into the first color. Dab the paint onto the wooden clothespin in a 1/4-inch line at an angle right near the edge of the clothespin. Your line doesn’t need to be perfect since this is a freehanded and random design. The beauty is in the uneven brush stroke. 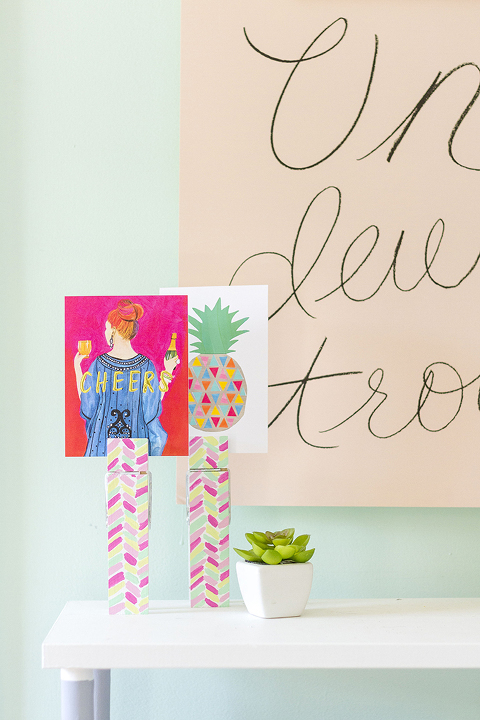 Repeat the colored lines across the entire clothespin until covered. My process went a little something like this: I dipped my brush into one color and painted a number of random dashes, leaving blank space between each at odd increments. Then, I cleaned my brush, dipped it in a new color and proceeded to fill in the blank spots. I did this one column at a time, one paint color at a time until the surface of each clothespin was covered with that bright, peppy, colorful pattern. Allow the paint to dry for an hour, and then clip your favorite cards and photos into the opening. Prop the pinned cards on the shelf for a unique (and totally custom!) take on the average art display.